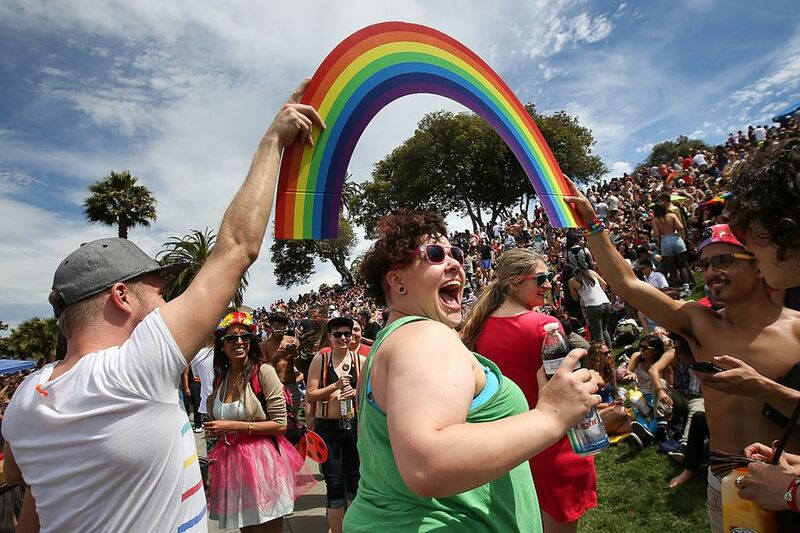 The San Francisco Pride Celebration and Parade--also known as the largest LGBT gathering in North America (and the second-largest in the world, after Sao Paulo, Brazil's)--rocks our city on June 27-28, 2015, the last full weekend in June. Here is an overview of what to expect, including transportation information. For pride-themed marches, concerts, parties, films and other activities leading up to and during the same weekend, check our guide to related LGBT events. SF Pride commemorates the June 1969 Stonewall riots, in which gays protested a routine police raid of the Stonewall Inn, a gay bar in New York’s Greenwich Village. The riots jumpstarted the gay rights movement, and in 1970, gatherings to mark their first anniversary were held in New York and San Francisco. With more than 200 parade groups and floats, hundreds of vendors and community organizations, and activities for everyone from gay seniors to hip-hoppers, SF Pride is two days of revelry. Help the organizers choose a theme for 2017 by adding your suggestions. The SF Pride Celebration, on Saturday and Sunday afternoons at and around Civic Center Plaza, has entertainment on multiple stages, community groups, exhibitors, merchants and food. Next to City Hall, the main stage showcases entertainers, leaders and the 2015 grand marshals. Past performers have included Shiny Toy Guns and Go BANG!. Scattered around Civic Center (roughly between Van Ness Ave. and Leavenworth St., and between Turk and Grove streets) are nearly two dozen stages and areas designated for various niches and groups within the LGBT community, including women, youths and families, senior citizens, people who are transgender, sober or deaf, Asian and Pacific Islanders, African-Americans, leather lovers and fans of country-Western, hip-hop, indie, electro/new wave or underground trance music. Just note that it gets crowded in Civic Center so if you're adverse to that, well you should probably stay away from Pride in general. Or face your fears and join in on the fun! Watching the Pride Parade is a rite of passage for all San Franciscans. Companies like Apple and Google have hopped on the band wagon and joined the parade in recent years, so if you work for one of those companies, they'll likely be organizing ahead of time. Who else you'll see? It's who won't you see: Politicians, the San Francisco Lesbian/Gay Freedom Band, San Francisco Gay Men's Chorus, government departments, nonprofit organizations, schools, churches and other organizations. But the parade kicks off with a literal roar, led by Dykes on Bikes. Back in 1976, a small group of women rode their motorcycles at the front of the pride parade and it's been a tradition ever since. You too can join the crew if you register for the parade and meet them at the start of the parade. If you're not in the parade, you can still enjoy it from the side lines—which is almost as much fun. The parade may end at Civic Center, but the party keeps going all day at Dolores Park. The hillside will be full of revelers from drag queens to teens all enjoying in what should be a sunny day and the celebration of life itself. Parking is a headache in San Francisco generally, and it'll be a migraine during SF Pride. Spare yourself and take public transit, bike or walk. The SF Pride website lists various transportation options. Many streets will be closed for the SF Pride Celebration and Parade and related events. Check with the San Francisco Municipal Transportation Agency before you venture out.